Launched last year and offering a new option for those wanting some of the features of a traditional DSLR body in a more compact package, the Panasonic Lumix DMC-G1 and its four-thirds format were arguably the front-runners as more camera brands look to travel down the more compact route. 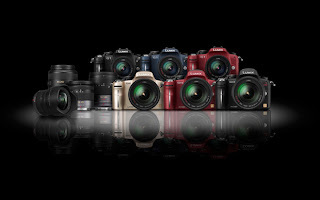 However in recent memory thanks to the Canon 5D Mark II and the Nikon D90, high-definition video has become a new sought-after feature in DSLR-style cameras, combining stunning quality with the versatility of interchangeable lenses. An update to the Panasonic Lumix DMC-G1 now yields a full high-def version which shoots 1080p @ 24 fps or 720p @ 60 fps, framed with a 3-inch LCD screen or digital viewfinder. Some other notables alongside this release are a new “video optimized” 14-140 mm f/4.0-5.8 lens (read: quiet) and a “Creative Mode” which allows for instantaneous aperture and exposure control during recording. As the online world moves to new forms of digital communication, video playback through new innovations like these will arguably be the mainstay in just a short little while.